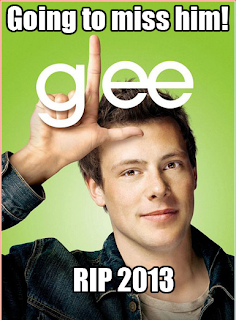 R.I.P to Cory Monteith who is also known as Finn Hudson to Gleeks everywhere. Turns out the heartthrob battled with drugs and was found dead yesterday in a hotel room in Vancouver, due to drug abuse. At 31 years of age this is a tragic loss for his family and to his soon to be wife Lea Michele- who he was due to marry in two weeks time :( It's so unexpected as you couldn't imagine someone from Glee dying, they're all too happy and chirpy to be susceptible to drugs. Rihanna: Cory Monteith, may your spirit be at peace, and may you fly with the angels... Heartbreaking, my prayers are with all of his loved ones! Post your condolences in the comments guys! The 26-year-old Glee actress, who plays Rachel in the hit series, said that she's "grieving" following the latest news from Cory's autopsy that the 31-year-old actor's tragic accidental death was caused by a toxic mixture of heroin and alcohol. Lea also wants to thank the fans for their continued 'love and support'. "Lea is deeply grateful for all the love and support she’s received from family, friends, and fans", she told People magazine. "Since Cory’s passing, Lea has been grieving alongside his family and making appropriate arrangements with them. "They are supporting each other as they endure this profound loss together. We continue to ask the media to respect the privacy of Lea and Cory’s family."